This past Sunday from noon to 5pm, eight Xbox 360 demo kiosks playing Star Ocean 4: The Last Hope were rolled out at the Akihabara Yodobashi Camera. Before the event began, numbered tickets were passed out to those lining up, and only 100 posters were handed out. Players experienced a 15 minute demo session. According to Famitsu, the event was a success — though, Famitsu.com does not provide any headcount estimates. 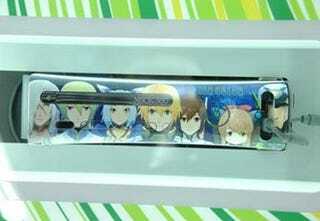 The faceplate included in the upcoming "Arcade Star Ocean 4 Premium Bundle" pack was on display as well.